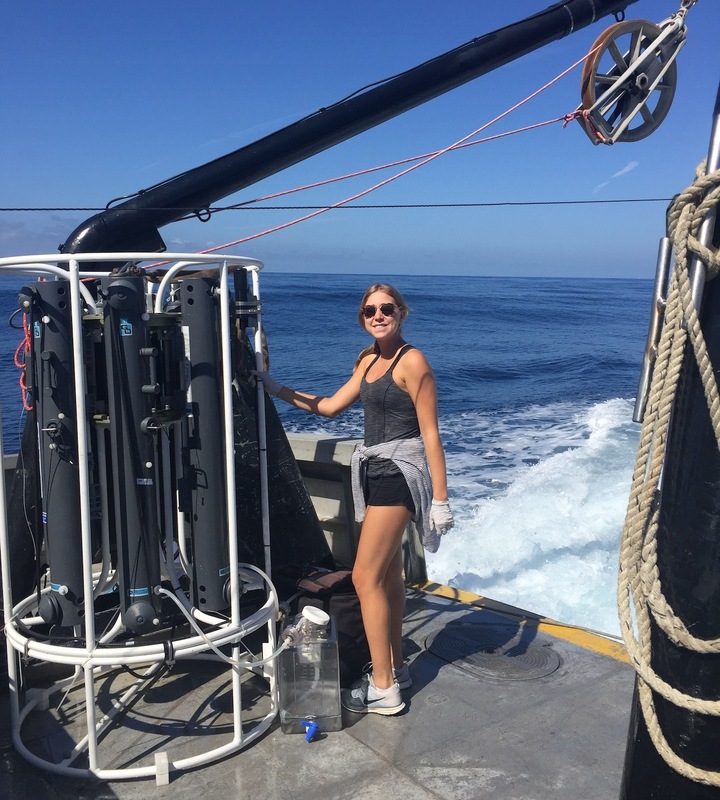 As a Wrigley Institute Intern this fall, I am assisting in the analysis and processing of their San Pedro Ocean Timeseries (SPOT) research. SPOT is a set of 10 years of data collected from 10 miles off the Southern California shore. We analyze aspects such as nutrients, salinity, temperature, nitrates, and fluorescence at this location up to a depth of 500 m over the course of three months. We analyze this data to see how these factors change with depth and season. So far, we have been playing around with different computer programs such as Sea Bird Electronics (SBE) and R studio. It is great to be able to familiarize myself with these programs because they have many real world applications. I have also loved working with my fellow intern Ignatious because it allows us to take on all tasks as a team. We work off of each other and progress twice as fast when we have two brains on the task. I was so fortunate to have been able to accompany the SPOT team on their October 2016 cruise. We left USC at around 6:15AM in order to make it to the docks by 6:45AM. We helped load all the equipment onto the boat and then took off on the 90 minute trip out. Once we arrived, everyone immediately got to work. It was exciting and pretty hectic. Each lab group knew exactly what they needed to do, and had to work quickly and efficiently in order to maximize time. Everyone on the cruise was so helpful and taught us so much. We learned all about the CTD device that is used to sample the water. Unfortunately, the automated machine was broken so we had to do it by hand. But it turned out to not be such a bad thing in the end because we were able to gain a greater appreciation for how oceanographic data used to be collected. I think that was our greatest take away from the cruise. We spent 9 hours on the boat just collecting the data for one month of one of the years of this study. It is just one little data point on a graph. And that 9 hours doesn’t even include the amount of time it takes to process and analyze the samples. Another essential lesson we learned is that dramamine is a must!!! 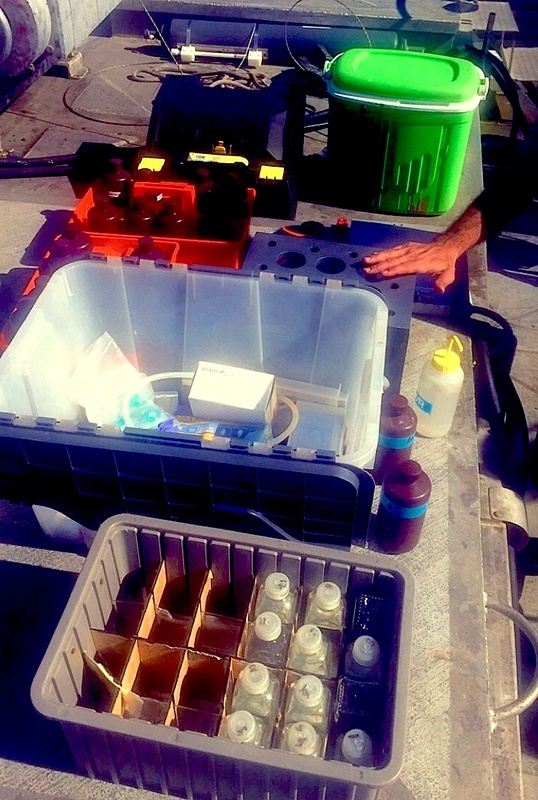 On top of participating in the cruise, we were able to process lab samples. My task involved organizing over 300 test tubes and putting 5mL of acetone into each of them. While some of you may think this is mundane and boring, I actually found it quite enjoyable. Doing the same task over and over again until completion is strangely therapeutic. It really gave me a good look into what a life of research would look like. The lab director Troy really appreciated our help, and it felt so rewarding to be able to contribute to something meaningful and be useful! Research is a potential field that I would like to go into after I graduate, so I am very excited to gain this real-life experience. Overall, I am extremely happy with my internship and am looking forward to seeing what the remainder of the semester holds! Nikki is a Fall 2016 SPOT Intern with the Wrigley Institute, and a senior at USC majoring in Environmental Studies. This entry was posted in Undergraduate, Wrigley Institute on November 29, 2016 by Jessica Dutton. Hey all. 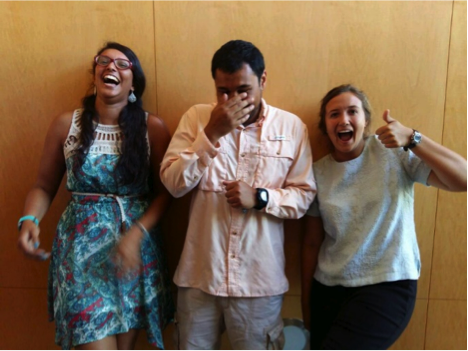 I am Yubin Raut from the Capone lab and this summer I had the incredible opportunity to do research at the Wrigley Marine Science Center (WMSC) on Catalina Island as the 2016 Victoria J. Bertics Summer Fellow. In addition, I was able to develop my mentoring skills as I got the chance to work all summer long with two undergraduate students via the Research Experience for Undergraduates (REU) program. As I work in a lab that deals primarily with studying the Nitrogen cycle, specifically nitrogen fixation, my main focus this summer was investigating nitrogen fixation associated with the invasive macroalgae, Sargassum Horneri, more commonly known as the “devil weed”. Nitrogen fixation is the process of converting dintrogen gas into biologically available forms of nitrogen (i.e. ammonia) that can then be utilized by other organisms for biosynthesis of essential compounds for life (i.e. nucleotides for DNA and RNA, amino acids for proteins, etc.). The organisms responsible for this process are referred to as “diazotrophs” and consist of many different prokaryotes. 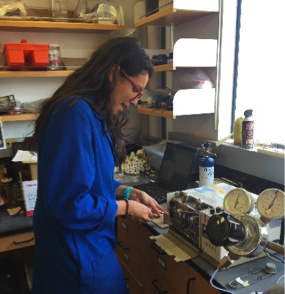 The REUs and I spend many hours this summer working in shifts at all hours of the day injecting samples into a gas chromatograph to indirectly measure nitrogen fixation rates by Sargassum via a method known as the Acetylene Reduction Assay (ARA). It was a research packed summer to say the least but being able to spend it on an island surrounded by the Pacific Ocean opened up venues to many adventures. Having the laboratory right on the waterfront of a Marine Protected Area enticed me to go swimming and snorkeling on a daily basis. Snorkeling expeditions led to glimpses of all sorts of creatures, the most notable of which was a giant seabass. On especially warm summer days or when things got too stressful with the research, the cold ocean was the perfect place to dive into to recharge myself. At the REU poster symposium where the two REUs (Camille (left) and Shannon (right)) presented their findings. During time off from the research, I was also able to explore the island inwards (i.e. Little Harbor, Two Harbors, Avalon, etc.). In fact, I witnessed my first fireworks theatrics this summer during the 4th of July celebrations at Two Harbors and Avalon. On a night hike to Mt. Wrigley, I also caught sight of my first shooting star. There were also many hours spent in the common area gathered around the ping pong and pool tables. Some might say that if you were looking for me this summer, your best bet was to look in the lab and if I was not there, I was most likely trying to convince some poor soul to play ping pong with me. It was an amazing summer and with fall semester well under way, I can definitely say I miss the island lifestyle. Yubin is a PhD graduate student at USC, in the laboratory of Dr. Douglas Capone. His research focuses on investigations of nitrogen fixation on invasive alga Sargassum horneri and native giant kelp Macrosystis pyrifera. This entry was posted in Graduate, Wrigley Institute on November 17, 2016 by Jessica Dutton.